Join your friendly and professional guide in your air-conditioned small group tour vehicle to explore the most profound and culturally significant monolith in Australia. Embrace the culture, geology and environment that is Uluru. 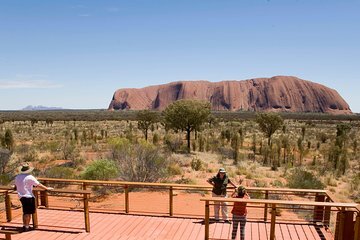 You will meander into Mutitjulu Waterhole, undertake the Mala Walk and visit rock art sites to learn of Uluru’s significance to the Anangu (local Aboriginal) people. Adjourn to the Talinguru Nyakunytjaku viewing area to watch an uninterrupted sunset away from the crowds to appreciate the expanse of this desert region at its most peaceful.